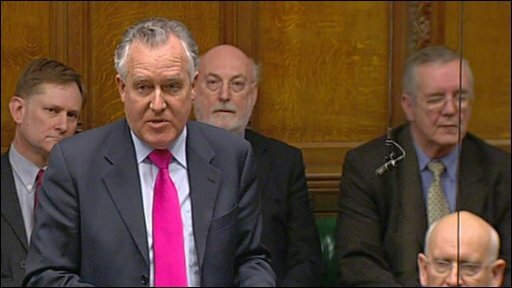 Former cabinet minister Peter Hain has apologised "unreservedly" for not declaring £103,000 of donations to his Labour deputy leadership bid on time. He told MPs he had made an "honest mistake", for which he had "always accepted full responsibility". Mr Hain was told in December he would not face police charges but a standards watchdog found him guilty of "serious and substantial failings" last week. He quit as work and pensions and Welsh secretary a year ago to clear his name. Mr Hain came fifth in the June 2007 deputy leadership race. That December he said some donations had not been declared. He said he had been "wrong" not to declare all the donations earlier, but there had been "no intention to deceive". The Neath MP added: "I have always accepted full responsibility for this mistake and I apologise unreservedly to the House." Under electoral law, donations of more than £1,000 should be reported to the Election Commission within 30 days. The matter was referred to the police but that investigation was closed in January, when prosecutors said there was insufficient evidence to charge Mr Hain with anything. He said at the time that after "10 months in limbo", he was happy to clear his name. But last week the Commons standards and privileges committee said the scale of the breach "justified public concern" and said Mr Hain's workload could not be an excuse for the errors. However, it accepted "there was no intention to deceive" and noted the MP had already "paid a high price for his omissions". Mr Hain's unsuccessful bid to replace John Prescott as Labour's deputy leader eventually raised £185,156 in donations - the highest of the six candidates. Of that, £77,000 was declared on time but in December Mr Hain announced other donations to his campaign had not been properly registered.